As expected, the day unfolded into a pattern of scattered showers. Before the rain moved in, however, we were treated to a spectacular display of pinks and purples, yellows and oranges as the sun rose outside the bedroom window of our little cabin in the woods. Certainly a fair trade-off for the drizzles to come. It's hard to find fault with a day that starts like this. In anticipation of the weather, we packed our agenda for the day with visits to indoor spaces. 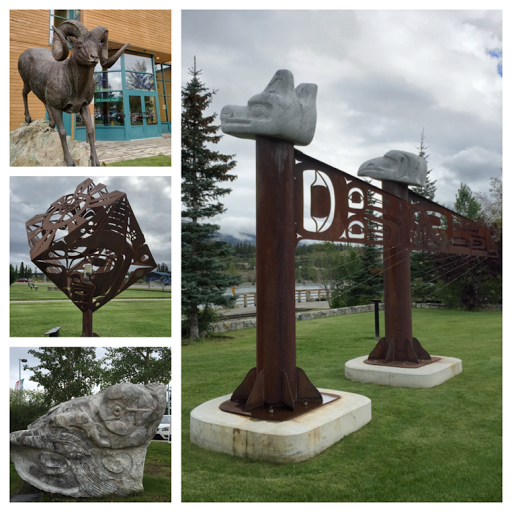 First stop was the Yukon Beringia Interpretive Center. I must admit that I have never picked up much of a passion for paleontology, but I was pleased to participate because Ken wanted to visit the museum. 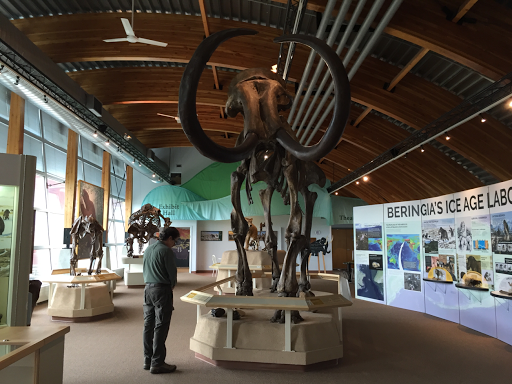 Almost an hour after our arrival, we left the Beringia center, both surprised that I was the one raving about how fascinating the exhibits were. Beringia is the name given a lost sub-continent between Asia and North America. Scientists believe that during the last great ice age more than 20,000 years ago, while much of earth's land masses lay inert under massive sheets of ice, the region from Siberia to Alaska and Yukon remained unaffected. Because glacier formation had sent sea levels plummeting as much as 400 feet, a submerged land bridge between the continents was exposed and a grassy tundra appeared that spanned the area. A variety of Ice Age mammals including the wooly mammoth, giant beaver, and steppe bison, thrived with this plentiful food source. Humans who hunted these beasts followed them from Siberia, establishing the first human migration into what became known as North America. Pretty interesting stuff, but what really got my attention was when I discovered how researchers learned so much about events and residents of long ago. In a word... permafrost. Make that two words...permafrost and gold. Many of the fossils that have revealed Beringia's story have been preserved in permafrost, a subsoil that has been frozen since the ice age. The effect was almost like freeze-drying processes used today. Not only have entire skeletons of long-extinct animals been discovered, sometimes frozen carcasses complete with skin, muscle and hair have been uncovered. 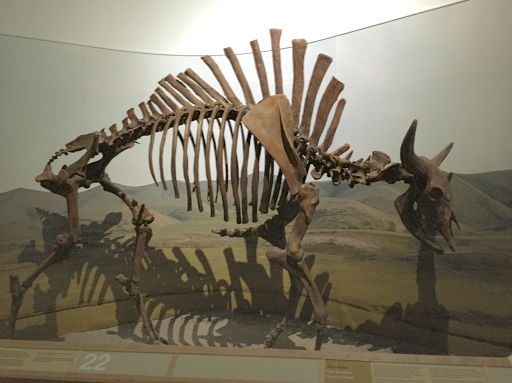 Steppe bison thrived in Beringia, accounting for 80% of the ice age fossils unearthed in the area. 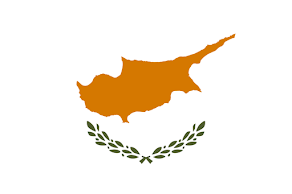 Who uncovered them? Miners. The search for gold provided the motivation for all those miners to go digging around in the permafrost and making scientific discoveries. We both found the story compelling and the exhibits of these ancient beasts fascinating. 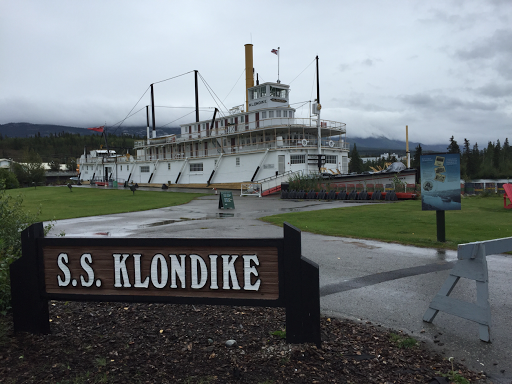 Our next stop was the S.S. Klondike, the largest sternwheeler riverboat on the Yukon River in its day. 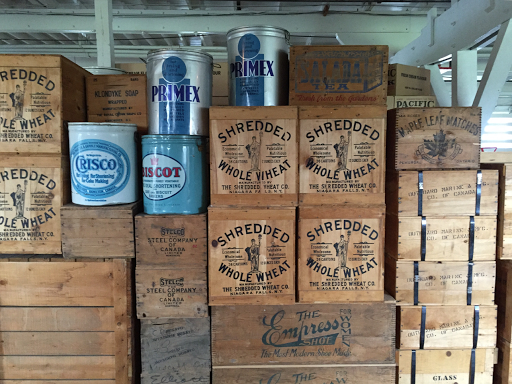 The 210-ft boat was built in Whitehorse in 1929 to haul supplies north and various mineral ores south. 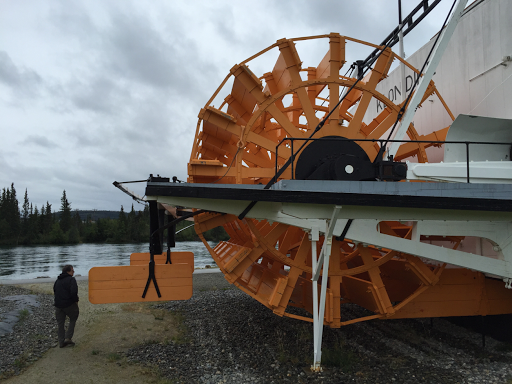 Before the advent of roads, the paddlewheelers formed a lifeline for settlements and mining camps in the Yukon. River transportation brought in the supplies, food and equipment needed for survival and production. In later years when trucks began to replace cargo ships in the Yukon, the Klondike was refitted as a river cruise ship. Though it now sits on dry land, the boat has taken on yet a new role as a museum commemorating an important period of Yukon history. From the paddlewheeler, we made our way to the Schwatka Lake Day Use Area to search for our first letterbox in the Yukon. Though it had not been found since 2014, the hidden treasure was still in great condition, awaiting our visit under a fallen log. Time and place coming together, we decided to eat our picnic lunch while there. As we were about to drive back toward town, a majestic golden eagle, with a wingspan of six feet or more, swooped down near the boat launch to greet us. Only a few minutes later, as we were cruising along Chadburn Lake Road, a burly black bear sauntered across the road a hundred yards ahead. When he heard our car tires stirring up gravel, he picked up the pace and lumbered off into the woods. Back in Whitehorse, we made a visit to the Old Log Church Museum. 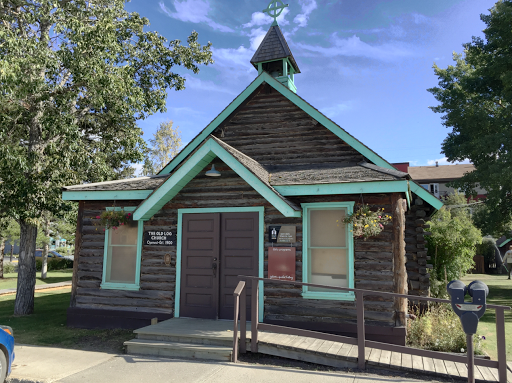 Built in 1900 as an outpost of the Anglican Church in Yukon, the quaint log construction is one of the oldest buildings in Whitehorse still on its original site. Replaced with a new church in 1960, the venerable old structure now houses a plethora of exhibits relating the history of the Anglican Church in the Yukon. Unlike our experience at the Beringia center, we actually remembered to have our Yukon Passport stamped at the church and the Klondike. In fact, the passport was helping to guide our rainy day exploration of Whitehorse. That's what led us to the Kwanlin Dün Cultural Center. 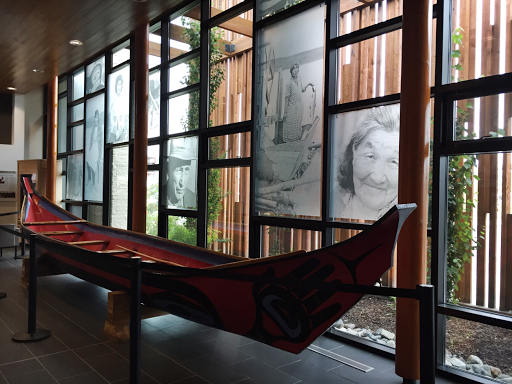 Sitting on the banks of the Yukon River, the center strives to celebrate the heritage and preserve the cultural and language traditions of the Kwanlin Dün native people. By the time we finished perusing the outstanding exhibits at the center, the rain had all but ceased. On the way out the door, we picked up a Whitehorse Art Walk brochure, a scavenger hunt through the downtown area to visit some of the city's public art, from sculptures to murals, totems to graffiti. We were immediately hooked and straightaway began our search for the 19 works of art, knowing we wouldn't stop until we found and photographed them all. Taking inspiration from the brochure's photographer, we accepted the daunting challenge of capturing an image of them in their often crowded setting while making the piece of art the clear subject of the photo. It was a fun way to end the day, and indeed, we did see each and every one. Before returning to our cabin in the woods, we made arrangements to extend our stay there for the remainder of our time in Whitehorse rather than transferring to an in-town hotel as we had planned. Now we can take tonight's cloudy skies in stride, knowing we'll have two more opportunities to see some aurora activity before leaving Whitehorse. Tomorrow we plan to drive the Klondike Highway to Skagway, Alaska, some 130 miles away. That's 3.5 hours, according to Google Maps. Never Say Never: With a chilling rain and temperatures well below 50, yes, we did use the car's "bun warmers" this morning. Ate His Boots? Yesterday we read an interpretive sign outside the Old Log Church about a longtime Yukon Anglican official who was called "the bishop who ate his boots." Persisting to the end of the lengthy text, we never learned how he gained such a nickname. Inside the museum today, the background was revealed. Admit it. Now you're wondering, too, aren't you? We won't keep you in the dark. 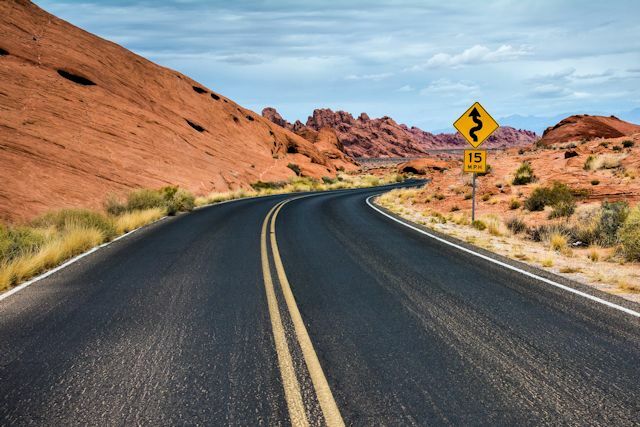 In 1909, the bishop and a local pastor paid a call on a remote community. On their return to Whitehorse, they became lost in the mountains and were overtaken by a winter storm. Facing starvation, they were reduced to cooking and eating their sealskin boots. Fortunately, they stumbled upon help later that day, or none of us would have heard this story. But then he probably wouldn't have earned that moniker either. 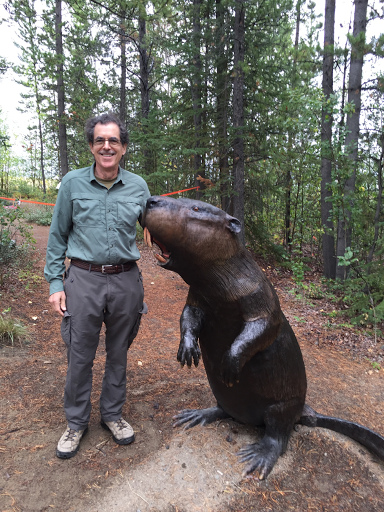 Imagine the giant dam a colony of beavers this size could build! Boats with the paddle wheel in the back are called sternwheelers; with wheels on the side, sidewheelers. Miners and settlers depended on the riverboats for essential supplies. Don't ask me. 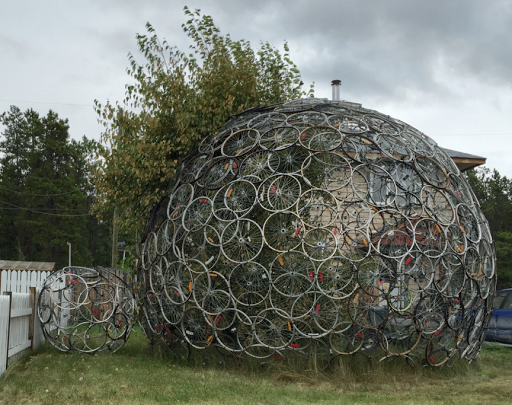 It was listed in the Roadside Attractions app.